With these words, the Prophet Simeon embraced Jesus when He was presented in the temple as a babe of forty days. Simeon saw prophecy fulfilled: the Messiah had come. Israel’s redemption was at hand and the Gentiles were to receive great Light. Simeon could now “depart” (i.e. pass away, die) in peace; his eyes had seen his own salvation in the person of his Lord, Jesus Christ. Truly, this is a prayer that each of us must make our own by our willingness to embrace Christ, not merely believe in God, and see in Him the salvation of the world. The Feast of Christ’s Presentation in the Temple is celebrated forty days after the Nativity to commemorate this event not merely in the Saviour’s life, nor in Simeon’s, but in our own hearts as well. 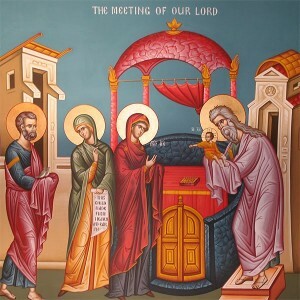 This year’s services take place this Wednesday, February 1, at 7 p.m. (Great Vespers, Litiya, and the Blessing of Candles) and Thursday at 9 a.m. (Divine Liturgy) Will you be there? The Prophet Simeon’s words also remind us of how we should face the rest of our days, peacefully, looking for a Christian end to our lives. This month, I will teach a one night class on Orthodox funeral practices. The class will examine decisions that we need to make so that all things are in order for our burials according to the teachings of our Faith, what is required by the Church or by law, what is permitted, and what is customary. As well, we’ll also touch on end-of-life decisions. What: A special presentation examining how a Christian can prepare for his or her last days. This short class will help attendees make personal plans now for a proper Church burial later. When: Thursday, February 16, 7 – 9 p.m.
Where: Holy Trinity Parish Hall, located at 119 S. Sparks St. in State College. Sometimes, we neglect discussing details of a funeral, the selection of a cemetery plot, or other details out of fear or denial. But is that the way a Christian should face the end of his days? The time comes when these decisions have to be made, with or without the input of the very one concerned. This short class will offer an opportunity to begin to make personal plans for a Christian burial, a Christian ending to our lives, in the sure hope of the Resurrection of our Lord and God and Saviour, Jesus Christ.